The 550 or so New Zealand nurses who served overseas during the First World War enlisted for the same reasons as the soldiers – duty, patriotism and adventure. They endured many of the same dangers and discomforts. But their war was also very different from the men’s. They often faced male prejudice. Although they were supposed to be treated as officers, the nurses had to fight for recognition of their rank. They were often paid less than the men they nursed and the male orderlies with whom they worked. They had to wear uncomfortable and unsuitable Edwardian uniforms and take care of their long hair. Some lost lovers, fiancés, husbands and brothers in the fighting. Others were away when their parents died. Unlike Australia, New Zealand had no official army nursing service when war broke out in August 1914. The determined Hester Maclean had been appointed matron-in-chief in 1911 and told to establish a military nursing service. But, despite her best efforts, this was still ‘merely a name … a phantom unit’ when war was declared. Finally Allen acted. On 25 January 1915 the Army Council in London accepted the New Zealand government’s offer of 50 nurses to serve overseas. Another 12 preceded them, joining a contingent of Australian nurses travelling to Egypt. In selecting the lucky 50, Maclean, as matron-in-chief of the New Zealand Army Nursing Service, chose nurses from as many different hospitals as possible. All the women were Pākehā, had at least six years of nursing experience and were unmarried. Their average age was 27. On 8 April 1915 the nurses boarded the SS Rotorua at Wellington’s Glasgow Wharf, cheered by a large crowd and serenaded by a band. At last the NZANS, led by Maclean, was on its way to war, though its destination was unknown. By the time the Rotorua reached Plymouth on 19 May the New Zealanders knew they were bound for Egypt. Nurses were badly needed in the British hospitals there to nurse the sick and wounded from Gallipoli. On 3 June the nurses sailed for Alexandria to be assigned to hospitals there and in Cairo. New Zealand hospitals were later established in Egypt. After some initial British prejudice about ‘colonials’, the well-trained New Zealand nurses were soon winning praise for their work. As the war went on, they frequently found that they were more competent and flexible than their British counterparts. They struggled, however, with the bureaucracy of military-run hospitals and the requirement to work alongside male orderlies. There was also the challenge of fierce heat and bed bugs. Casualties poured in from Gallipoli. As well as terrible wounds, the nurses treated dysentery and enteric fever (typhoid). They worked extremely long hours, sometimes from 7 a.m. until midnight or later. By August a second contingent of New Zealand nurses had reached the Middle East and a third, travelling on the hospital ship Maheno, was on its way from New Zealand. The nurses were given short but much-needed periods of leave. As well as brief stays at the Aboukir Rest Home, near Alexandria, they enjoyed excursions to the Pyramids and the Sphinx or up the Nile. Other treats were dinner or tea at a Cairo hotel. 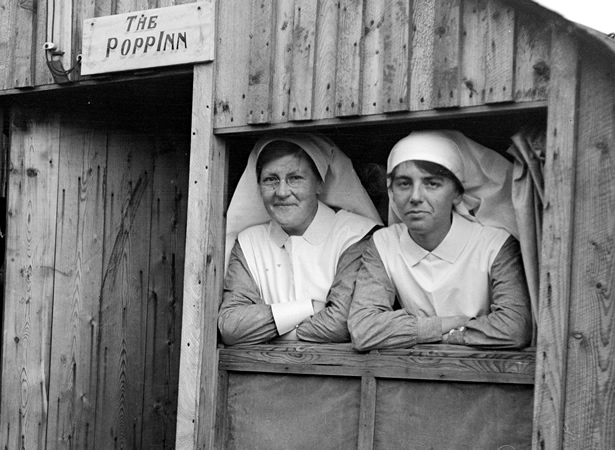 A number of NZANS nurses worked in the Middle East throughout the war. There was grief and anger in New Zealand when 10 NZANS nurses died on 23 October 1915. They were part of the staff of No. 1 New Zealand Stationary Hospital (No. 1 NZSH), which was sailing from Alexandria to Salonika on the British transport, Marquette. Not marked as a hospital ship, the Marquette was torpedoed and sank in the Aegean Sea. Along with New Zealand Medical Corps doctors, orderlies and chaplains, 11 nurses left for Egypt on New Zealand’s first hospital ship, the Maheno, in July 1915. All were shocked by the condition of the first wounded and sick Gallipoli casualties taken aboard at Anzac Cove on 27 August. For two days everyone worked without rest and the ship’s operating theatres were in constant use. On the 28th, the Maheno left for the island of Lemnos with 445 patients. From there the wounded were taken to Alexandria on other vessels. There had already been deaths on the Maheno and more men died during the short voyage. Over the next few weeks the nurses worked punishingly hard as the Maheno made several trips between Lemnos and Gallipoli, always bringing back hundreds of patients. The soldiers were grateful for the nurses’ dedicated care and for proper food after months of bully beef, biscuits and water. After broken sleep in cramped accommodation, the nurses began work at 6.30 a.m. and often did not finish until near midnight. New Zealand’s second hospital ship, the Marama, sailed from Wellington on 5 December 1915. Like the Maheno, the Marama was to become part of the Great White Fleet ferrying wounded from France across the Channel to hospitals in England. After the grim months on Gallipoli, the evacuated troops were reorganised into the New Zealand Division, which sailed for France in April 1916. The nurses followed. By July No. 1 NZSH had left Egypt and was established in a convent and a school building at Amiens, about 25 km from the front line. At night, wrote one nurse, ‘one can hear the bombing very plainly’. Although officially prohibited from serving at the front, many nurses came very close to the bullets and the shells. Through the coldest winter for 70 years, the nursing work was hard and unrelenting. Casualties poured in, often straight from the trenches. Operations were performed without a break for up to 36 hours. As well as battle wounds, there was the horror of gas gangrene, caused by bacteria in the soil of northern France. Amputation was often the only option and many of these men died. As time went by, more New Zealand nurses were transferred to France from England. At the end of May 1917, No. 1 NZSH moved north to Hazebrouck, near Armentières. The wards in the 1040-bed hospital soon filled with casualties from the Battle of Messines. Many had head injuries. Nurse Elsie Grey wrote: ‘It is terrible to see these men … numbers of them become paralysed and [are] minus arms and legs or eyes.’  Many were also suffering from shellshock. There were frequent night bombing raids. Then in July came the appalling evidence of mustard gas. This caused burnt and swollen eyes and blindness and attacked the lips, nose and lungs. The result was often fatal pneumonia. On the night of 31 July Hazebrouck was bombed heavily. Surgery ceased, all 600 to 700 patients were evacuated and the nurses left the next day. Six weeks later No. 1 NZSH was re-established on a rise at Wisques, west of Hazebrouck. This more extensive hospital consisted largely of Nissen huts. It could take 800 patients initially, and later expanded to 1000. Not all the huts were completed until the end of 1917, by when a bitter winter had set in. The area was very damp and swampy. Deep trenches had to be dug around the tents, with duckboards made of wooden slats to enable movement. The nurses suffered badly from chilblains and trench feet, and were often ill. In October 1917 they nursed casualties from the devastating Battle of Passchendaele. As another winter loomed, the war news was improving, but a new problem was causing concern: influenza. Even after the armistice was declared on 11 November 1918, work at the hospital continued and the nurses were deeply distressed as men died of flu after surviving years in the trenches. No. 1 NZSH was the first New Zealand medical unit to be demobilised, on Boxing Day 1918. In its last, most active year, it had admitted between 700 and 1200 patients a month. Behind those official statistics lay thousands of hours of gruelling nursing work and a unique spirit of camaraderie. By the end of 1915 there were some 3000 sick and wounded New Zealanders in England. They were either in British hospitals or at a civilian-run New Zealand hospital at Walton-on-Thames, near London. Once the New Zealand Division was in France, a military-run British medical base for New Zealanders was needed. No. 1 New Zealand General Hospital (No. 1 NZGH) was set up by New Zealand medical staff who moved into a British hutted hospital at Brockenhurst, near Southampton, in June 1916. Also used were two hotels in the village, Forest Park and Balmer Lawn. The latter became a neurological centre. In August 1916 the Walton-on-Thames hospital became No. 2 NZGH. British Voluntary Aid Detachments (VADs) served in many theatres during the war. Set up in 1909 with the help of the Red Cross and St John Ambulance, they provided nursing services at rest stations, on ambulance trains, and in hospitals. Because of the emphasis on nursing, the majority of volunteers were women. New Zealand had no VAD scheme of its own during the First World War, so most of the VADs recruited to work in New Zealand hospitals were New Zealanders who were already living in England or travelled there to offer their services. Their duties ranged from scrubbing floors and cleaning surgical equipment to dressing wounds and comforting patients. The New Zealand Division’s involvement in heavy fighting on the Somme in September brought a huge increase in casualties. Walton could initially take about 350 patients, but marquees and four hutted wards were added. As the casualties mounted, the nearby historic hotel of Oatlands Park was converted into a hospital for medical, limbless (‘limbies’) and tuberculosis cases. The attractive surroundings of Brockenhurst and Walton played their part in healing the patients. The relief of reaching these safe havens in ‘Blighty’ was even greater because it often followed a long, gruelling journey from the battlefield. The men were delighted and comforted to be nursed by fellow New Zealanders. The nurses also worked at No. 3 NZGH at Codford on Salisbury Plain, and at the New Zealand Convalescent Hospital at Hornchurch in Essex. The wounded arriving at Dover were taken to Walton; those sailing into Southampton usually headed to Brockenhurst. As the men recovered, they went to Hornchurch to convalesce and then to Codford to be ‘rendered fit again for service’. Many, of course, never fought again and were sent home to New Zealand on the hospital ships. New Zealand nurses worked in an extraordinary number of places during the war, not all as members of the NZANS. Approximately 100 served with French or British nursing organisations. Christchurch-based journalist and labour activist Ettie Rout formed the New Zealand Volunteer Sisterhood (NZVS) in April 1915 to help nurse ‘sick and wounded colonials’. In November she sent the first group of volunteers to Egypt, where they found work in convalescent homes, soldiers’ clubs and canteens — setting the pattern for the Sisterhood’s work for the rest of the war. Rout’s anti-venereal disease work upset many NZVS sisters, and by 1918 she had little to do with the organisation she had founded. Wellington nurse Laura James, for example, joined Queen Alexandra’s Imperial Military Nursing Service (QAIMNS) in Britain in August 1914 and went to France, where she served in Rouen and at Arras. She was decorated for her war work. Margaret Hitchcock and Lily Lind, both from Wellington Hospital, were in England when war was declared and joined the French Flag Nursing Corps. After working in a French military hospital in Rouen they nursed on hospital barges. In 1916 New Zealand nurse M.E. Brown was working on an ambulance train in France. Sister Emily Peter, a 56-year-old veteran of the South African War, travelled to England early in the war and joined the Red Cross. She nursed in Serbia in very challenging conditions until contracting typhus, which forced her to return to England. Both Brown and Ethel Lewis, who also served in Serbia, were decorated for their work. On Armistice Day thousands of men were still dying, wounded or sick, and the nurses continued to care for them. The last New Zealand hospital in Britain did not close its doors until mid-1919. As the hospital ships and transports brought the sick and wounded home, nurses accompanied them, working hard all the way. The first large contingent of almost 40 nurses who returned to New Zealand on the Tainui at the end of April 1919 were given a government welcome. But coming home was hard. Years of adventure and emotion were abruptly replaced by dull routine or family duties. Despite undergoing painful inoculations, many had suffered severe illness — everything from dysentery to pneumonia — and were physically and emotionally exhausted. Those who were well were desperately needed during the influenza epidemic and to nurse returned soldiers at the country’s many military hospitals. Skilled senior nurses were also required in understaffed civilian hospitals. Others went into private nursing, sometimes joining forces to set themselves up in business. Some who had been on leave from their hospitals returned to their pre-war civilian posts. Others were not so fortunate. Despite heading the NZANS in Britain during the war and being awarded the Royal Red Cross in 1917, former Christchurch Hospital matron Mabel Thurston was refused her old job. The doctors who worked alongside New Zealand’s nurses during the war appreciated their skill and courage, but male military discrimination continued, even after 1918. The nurses were treated very differently from the returned soldiers. Even experienced sisters who had served overseas did not always receive proper financial recognition after the war. The nurses are remembered in a variety of ways. The Nurses’ Memorial Chapel in Christchurch, opened in 1927, was built in memory of Lorna Rattray, Margaret Rogers and Nona Hildyard, who died on the Marquette. All three had worked at the city’s hospital. The chapel also honoured those who lost their lives in the influenza epidemic. It now commemorates the contribution and sacrifice of all nurses in both world wars. Sixteen New Zealand nurses, including the 10 from the Marquette, were remembered on an honours board in Christchurch Cathedral. There are other memorials to Marquette victims. In Oamaru Isabel Clark is remembered by a memorial oak, a plaque at the hospital and a gravestone at the cemetery. Mary Gorman and Catherine Fox are named on family gravestones in Waimate Cemetery. In December 1915 two beds were donated to Kumara Hospital in honour of Helena Isdell and Mabel Jamieson. Nona Hildyard’s portrait was painted by leading Christchurch artist Richard Wallwork and presented to the people of Lyttelton. The painting is now in Christchurch Art Gallery. Hildyard is named on the Lyttelton war memorial, while the name of Margaret Rogers appears on the Akaroa monument. All the Marquette victims but Rogers are named on the Mikra war memorial in Kalamaria, Greece. Rogers is buried in the Mikra British Cemetery. Those who served and survived also continue to be remembered. In 2015, for example, 19 First World War nurses from New Plymouth, including three Marquette survivors, were named on a canvas installed in the chapel at Taranaki Base Hospital. This article was written by Anna Rogers and produced by the NZHistory team. Lieutenant H.T.B. Drew (ed. ), The war effort of New Zealand: a popular history of (a) minor campaigns in which New Zealand took part; (b) services not fully dealt with in the campaign columes; (c) the work at the bases, Whitcombe & Tombs, Wellington, 1923. Anna Rogers, While you’re away: New Zealand nurses at war 1899–1948, Auckland, 2003, p. 8. May Chalmers: Kai Tiaki, 1 April 1916, p. 79. We have 1 event in history, 21 biographies, 40 articles, 2 comments related to New Zealand Army Nursing Service. I think the article somewhat underplays the dedication of the women serving with the New Zealand Volunteer Sisterhood, and the dangerous situations (not just service in canteens, etc) in which some of them served. In Arnos Vale Cemetery, Bristol, England, is a memorial plaque to Rhoda Mildred Stephens, who served with the New Zealand Volunteer Sisterhood in Egypt and (seconded to the Scottish Women's Hospital) on the Macedonian Front, just behind the front lines; she was later with Ettie Rout in Villers Bretonneux doing relief work for French refugees. She was awarded the Serbian Croix de la Misericorde for her efforts (and an image of it is carved on her memorial). Her exploits were documented in a number of NZ newspapers during and just after the war. I can supply further details on request, but I would be very interested if any readers had further information about Miss Stephens. I've written a song called Nurses of Anzac and I'd love you to hear it. I've put it on my website on the VIDEO page. But I'd love to share it more on WW1 nurses sites. What do you think? Would you possibly have time to view it?